The second annual Big Share™—the area’s local online giving day—raised over $263,000 from more than 2,000 donors in 24 hours on March 1. A total of 70 nonprofits were part of the collaborative fundraiser, hosted by Community Shares of Wisconsin (CSW) for its member nonprofits. Wisconsin Council on Children and Families holds the top-earning spot this year, raising over $11,000. Others at the top of the list included Wisconsin Literacy, Wisconsin Alliance for Women’s Health, and Wisconsin League of Conservation Voters Institute. MCF also matched the $14,000 worth of Big Share funds that CSW groups added to their endowments housed at MCF—for a total of $28,000 put into endowments for the future of these nonprofits. “The Big Share relies on the viral nature of social media to get many people involved, especially younger donors. A text-to-give option this year broadened the appeal to donors, thanks to a Technology Innovation Grant from The ZenDesk Neighbor Foundation. The Big Share attracted more corporate sponsors this year and therefore was able to award more prizes to groups, either given out randomly or given to the groups with the most donors or the most dollars raised in a single hour. Media sponsors included 105.5 Triple M, Isthmus, and WKOW. Other sponsors who gave prize gifts or supported the day in other ways included Java Cat, Home Savings Bank, Mini of Madison, BCycle, Zendesk, Yelp, Colectivo, Delta Properties, Kollath CPA, Supranet, National Guardian Life, Culver’s, Google, Dane County Credit Union, Plan B, Sardine, and Sprinkman Real Estate. Special collaborators included Madison Commons, Earthling Interactive, 100 State, Reverbal Communications, High Tech Happy Hour, Raise4It, and Social Media Breakfast Madison. 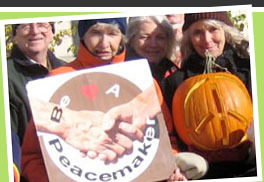 Community Shares of Wisconsin is a member-directed fundraising federation; all of its member groups hold a seat on the CSW board, and this unique cooperative structure promotes accountability and transparency. CSW raises money through workplace giving campaigns, The Big Share, the Community CHIP® program at Willy Street Co-op, and the Round Up program at Capitol Centre Market. Community Shares not only raises money for its groups, it actively helps expand their capacity through training, 1:1 support from experts, networking, and technical assistance. Since its inception in 1971, CSW has worked to build the social and environmental change movement by connecting its member nonprofits with new generations of donors and leaders. Madison Community Foundation encourages, facilitates, and manages long-term philanthropy. Since 1942, the foundation staff has helped people realize their philanthropic goals, allowing them to support charitable interests anywhere in the world. The community foundation also awards grants throughout Dane County to build communities. More information is available at www.madisoncommunityfoundation.org.